One of our most treasured products is the The CVC Roadii Lightweight Grill. We have never really shown you how amazing these are mainly due to them not being mass produced in China. We were always a bit worried that if we did make a fuss about them that our supply of stock would just dry up and we would never be able to keep on top of demand. Things have moved on quite a bit now in the 3 years we have been operating the web shop and as we are growing you will find out product range shrinking as we ditch a lot of generic vehicle part items we don’t need to sell any more. Our goal is to bring to the table unique innovations that we use ourselves that we are proud of. Made exclusively for us at CampervanCulture.com the CVC Roadii Firegrill Lightweight grill is a complete portable fire cooking system, perfect for wild camping, overland travel, or just get together’s with family and friends. You have seen us use this set up many times in our videos. Set up in seconds, the Roadii can be used just about anywhere and it’s been specially designed to fit inside your spare wheel so that no valuable storage space is taken up inside your vehicle. Whether enjoying a glass or two around the fire, toasting marshmallows or creating a fantastic outdoor feast, its your call. This is perfect for use where you want to cook and have a campfire that doesn’t burn or damage the ground. The firepit consists of a tripod with three two part legs, reduced weight wheel hearth and height adjustable stainless steel grill. 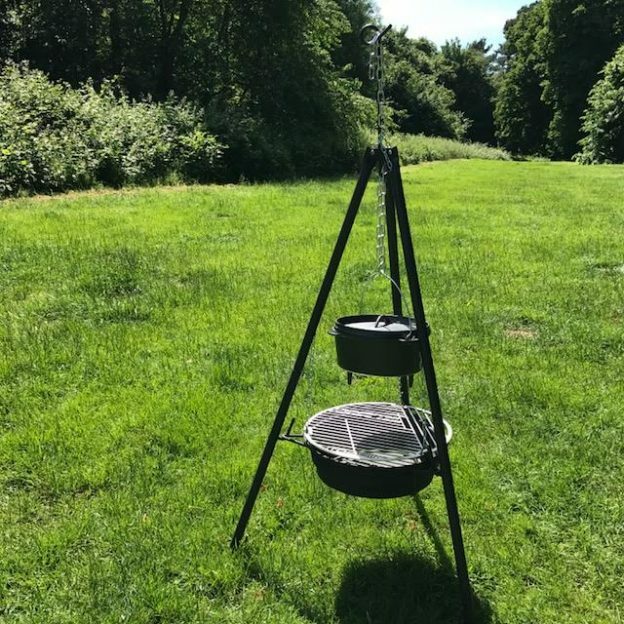 The tripod contains the clever single handed operation grill height adjustment system and has an integral hook at the top for the chains or for a pot to be hung etc. This enables you to place the grill at the perfect cooking height without burning your fingers or risking your food ending up on the floor after a fumbled grab with a tea towel. We think things you buy should last. The CVC Roadii Lightweight Grill uses quality materials of heavier gauge than is common with imported products and the grills are made in Britain from solid stainless steel plate. It comes direct from the steel mill with a great natural finish, so we leave it that way. Where possible we have avoided energy wasteful polishing and finishing methods making things in a low impact way avoiding bad or polluting processes. These are made in batches using local suppliers supporting local jobs and keeping product miles low. 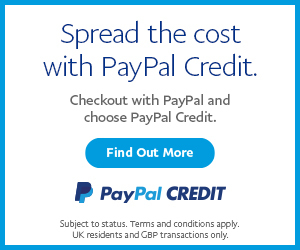 See for your self why this product really turns us on by watching the video below. This entry was posted in Product Review on June 3, 2017 by jed@CampervanCulture.